88SLIDE: the daily one minute trivia challenge is one podcast that I catch every day. It's a one-minute game show ... and I love game shows. Total gameshow junkie. Always have been. Plus, a total useless data / information / trivia junkie. I coulda been a contender on Jeopardy. But, was always too lazy. I spoke to Noah Bonnett (on the left, with the beautiful hostess, Rachel), the producer/founder of the one-minute trivia show. If you haven't watched it, go check it out and then I'll wait for you to come back. So, Noah's background is working at a production company in LA, Endemol (they do Extreme Makeover: Home Edition, Fear Factor, Deal or No Deal. His experience was on game shows. 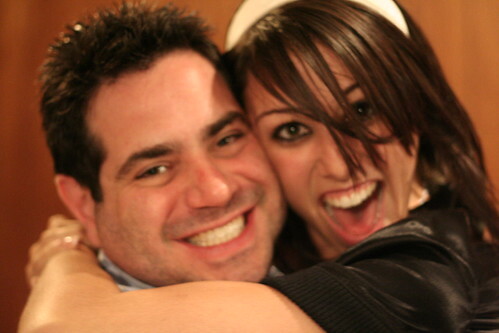 He met the host, Rachel, when she came to do a pilot for MTV that Noah shot, they stayed in touch and he reached out to Rachel to see if she would be interested in doing the same thing, but as a video podcast - a one minute game show, that turned into 88SLIDE. If you look at the first interviews on 88SLIDE, you can see how Rachel has grown into the role. Since then, she's gotten plenty of offers to do other things, but she's sticking around - she's focused on school. Aside: At Vloggercon, Rachel and I had a long discussion about philosophy. The girl is smart. Smart and pretty. And, that's her with me laughing at us. Or me. It's the one-minute interactiveness that makes 88SLIDE work - and you can plug in new people, and new ideas, and the format works. It's like the old TV game shows - Jeopardy, Wheel of Fortune, Family Feud - they all work in different cultures. If you want to talk about the flat world ... look at the same shows with different hosts. The master dream would be the same for 88SLIDE just one of many productions. Expand to Hindi language, Spanish language, Sports oriented, Bible oriented ... . The format is bullet-proof, so you can change out hosts to the best people. And, scoop, they are going to be announcing a major wireless carrier in the next few weeks, that will be carrying 88SLIDE on its network, stream to phones. From a PR standpoint, 88SLIDE does take product / sponsorship. The 88SLIDE doors are very open for advertising and sponsorship opportunities, but not traditional methods. Noah sits down with the companies, to find the message that they want to get across, and works with them for a tailor-made message that works for everyone. 88SLIDE looks at brand integration, sponsorship, wardrobe consideration (they have a few potential sponsors), music consideration (labels put in the music). Anything that helps the show - but gives something to the sponsor AND the audience. The value-add for everyone, even beyond just the $10 gift certificate. 88SLIDE is like a hybrid of user generated content, but with the consistency of a studio. It's because of the talent that he gained at the large production, that translates to the user generated format - keeps it classy, but keeps it real. Like Blaine (the announcer), keeps it real with his DITC T-shirt. Being realistic, prize sponsorship is an integral part of any game shows, dating back to the 1950's. It's natural and organic, and the sponsors come in for that one-minute game show. It's non-intrusive, quick and 88SLIDE works to keep the flow of the program. As for the questions, the level of difficulty is corollary to the size of the prize. And, by sticking with the one-minute, it keeps the audience involved. The day-to-day retention is very high, and the people come back every day to see if they won, and to see what the correct answer. The 88SLIDE viewers email and text message the answers - a true interactive podcast out there. Other podcasts are comment-enabled, but you do not become part of the program. 88SLIDE is trying to make its audience part of its one-minute, fun, action-packed show. If you have ideas for sponsorship, ping Noah at info@88slide.com. The demographics are collected from a third-party survey. The viewers are numbering in the five-figures trending towards six-figures, with the age of 18 to 34, 75 percent male, with 33 percent as college graduates and 21 percent with master's degrees and 44 percent make $60K to $150K and close to 80 percent have listened to at least 6 episodes and 76 percent say they watch/listen everyday with 94 percent watching the whole episode. Not shabby demographics. If you think about it, it's viewers through YouTube, Blip.tv, iPods and iTunes, 88SLIDE and soon-to-be major wireless carrier. Closing ... on the ValleyWag Amanda Congdon rumor: Noah has set up Rock Creek Park Productions and is always looking for talented people, and would love to chat with Amanda. Be flattered, she's a POP-PR jots reader. Judging by the way she's laughing, she's seen your THUG-LIFE masthead picture. Seems pretty darn interesting! You get a Spanish lesson today, too! Oh, the thug life masthead isn't bad. I thought it was cool. BTW, Jeremy, I'll take you on at Jeopardy or Wheel. Can't promise you'll win, however. This was one of the more suprising finds I've had since entering the blogging world. I thought the sight was great! The material is hilarious and the energy radiates through the computer screen. It is true that it contains senseless trivia but all in all a great find. Johnee Bee does a great job with it - always entertaining!